Oct. 16, 2018, 5:19 a.m.
June 14, 2018, 10:59 p.m.
Asset Allocation is essential to being a successful investor. Asset allocation tells what percentage of your overall portfolio is in stocks, bonds, and other investment vehicles like real estate, precious metals, etc. Looking at your portfolio in terms of allocation instead of individual positions simplifies the picture and takes much of the stress out of investing. When investing based on asset allocation day to day price changes in the market are treated as noise. In addition the idea of timing the market or getting the best deal become non issues. Instead long term factors of expected return, overall risk and investment costs are brought into focus. In the most basic sense asset allocation refers to the percentage of your investments that are in stocks vs bonds. Stocks are generally riskier investments but have much higher rates of returns, while bonds are safer but offer less upside. However those figures are not inflation adjusted so the real rate of return is lower. Inflation has averaged about 3.2% so we need to subtract 3.2% of all of those figures to get the real return (which equates to actual purchasing power). So Why Not Just Pick a 100% Allocation in Stocks to Maximize Returns? See the chart below for a comparison of Vanguard Total Stock Market ETF (VTI) vs Vanguard Total Bond Market ETF (BND) from 2007 to 2011 which covers the “great recession”. The stock market fund lost about 50% of its value at the bottom of the crash in March of 2009 while the bond fund was only down a few percentage points during the worst of it. So the question is can you stomach a 50% draw down? Would you be tempted to sell near the bottom locking in the losses? Or could you ride it out? Turns out those who were able to ride it out were rewarded. The 10 year chart below shows stocks well in the lead even though they were behind for many years. Why Do Stocks and Bonds Behave Differently During a Recession? In times of panic assets are shifted to relative safety. In 2008 bonds became more attractive because of their stability compared to stocks and also because interest rates were being cut making bonds funds more valuable. Gold also had a nice run from 2008 - 2010 because of the “safety” effect. Then the economy recovered, the safe assets became boring again and stocks took off. There isn’t a one-size-fits-all solution to asset allocation. In fact there are dozens of categories to choose from. It depends on how long your savings horizon is, ie when you expect to start withdrawing money, as well as how much risk you feel comfortable with. In general, though, most financial advisors recommend having more stocks when your investment horizon is long and less stocks when you’re closer to the withdrawal date. When you have a long investment horizon, you have more time to recover from losses (and benefit from gains), whereas if you need to withdraw the money in the next couple of years you won’t be able to recover from a stock market crash. Your asset allocation is something to review regularly. It may change over your lifetime to “lock in” gains by shifting to less risky assets. A type of fund called LifePath funds do that for you. They automatically shift from stocks to bonds as your retirement date gets closer. Blended funds offer an easy solution by providing a pre-set asset allocation with automatic rebalancing. Blended funds are usually called things like aggressive (80% stocks, 20% bonds), growth (60% stocks, 40% bonds), moderate (40% stocks, 60% bonds), but read the prospectus to know for sure because there is no industry standard for those terms. When you decide on your asset allocation and match your portfolio to it the “bet” you are making boils down to the long term viability of the global economy (or the categories you selected). Personally, having my asset allocation dialed in, I sleep very well at night. I ignore the static of day to day price changes and even corrections because I know it will average out. The point of setting an asset allocation should not be to chase returns or try to time the market. Nobody really knows where the market is going so timing it is basically impossible. People do get lucky sometimes of course. But because of confirmation bias they mistake that luck for their amazing investing talents. That makes them bolder and more likely to suffer losses next time around. Asset allocation is not something you setup once and forget about. 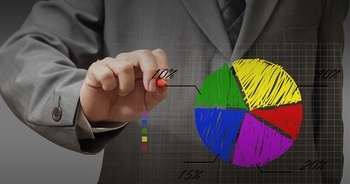 Your asset allocation needs to be maintained through a process called rebalancing. Because of fluctuations in market prices, as your investments grow the percentage in each type of investment relative to your entire portfolio will change. You’ll need to move some of your investments around to keep the same asset allocation. When one category does well, you’d sell some of it and buy more of the category that didn’t do as good, with the goal of maintaining the desired ratio. As time goes by, your risk profile and investment priorities might change. For example, reducing risk when getting close to retirement. When you rebalance you sell what did well and buy what didn’t do well. Rebalancing is a built in way to capture gains and follow the stock market rule “buy low and sell high”. As you work and save over the course of your life you will probably end up with multiple savings and retirement accounts at different financial institutions. The investment choices you have access to won’t likely line up with your asset allocation goals. That’s where you need a tool to track and organize your entire investment portfolio across all accounts. We created the Net Worth Dashboard to do just that for ourselves and we think you will find it helpful. A smart asset allocation plan allows you to grow your nest egg, retirement or college savings in a way that is aligned with your goals, your timeline and your comfort with risk. Because everyone will have a different ideal asset allocation, the only way to really do it wrong is to not think about it at all. The Wealth Meta retirement savings calculator lets you play around with different asset allocations and see how they performed based on historical data. Try our Net Worth Dashboard for tracking your net worth, including your asset allocation.